A few days ago, my usual museum companion and I walked over to the Scottish National Gallery of Modern Art for the final day of their exhibition on The Amazing World of M.C. Escher. Though the exhibition had been on all summer, because we’ve been distracted with viva and visa nonsense, we completely forgot. So, when we arrived at the gallery and discovered the line to get in stretched all the way out into the street, we were somewhat dismayed and saddened, particularly because neither of us felt like waiting over an hour to be shuffled along through the exhibit. As we stood there, watching more people arrive and join the queue, we got to talking about the desire we (people) have when it comes to seeing things ‘first-hand.’ After all, just like us, all these people had arrived for one last chance to see the gallery’s exhibition; the most devout of which were happily standing in line. Which got me wondering: why is that? Why do we stand in line to see a piece of art that we can see online from the comfort of home? 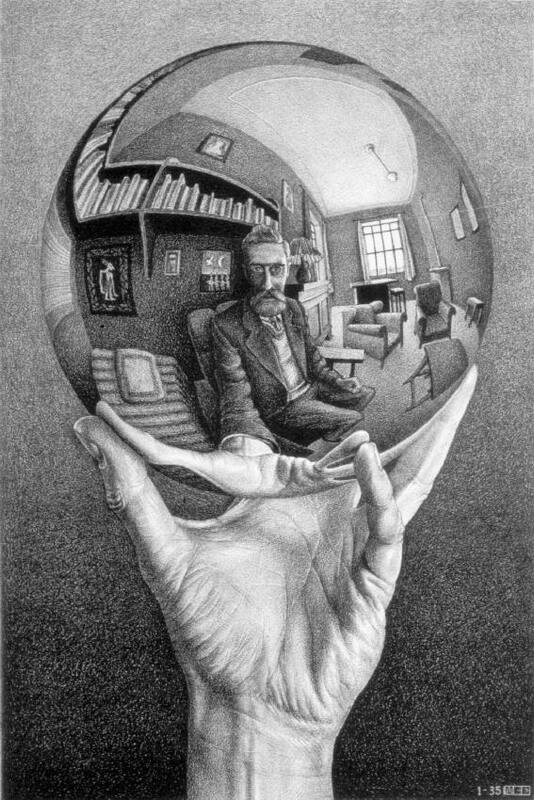 What’s the difference, say, of seeing Escher’s “Hand with Reflecting Sphere” in person, compared to seeing it here? Here, I can take my time with the art. I can look at the details. Moreover, because the internet is a swirling charybdis of creativity, I can explore more about Escher, his art, and how others have adopted, amended, and altered his work. So why do we stand in line to see the ‘real thing?’ Does it connect us to the work somehow? Do we get more of a ‘genuine experience’ out of first-hand, close encounters? These questions got me further thinking about the ‘genuineness’ there is in being close to a piece of art, and why we feel that seeing something, in person, ‘with our own eyes,’ somehow transforms that experience into something more authentic than that provided by a google image search. Which seems even more odd to me when most people I’ve witnessed at galleries insist on taking a photo of the art itself. That’s a swirling mess of humanity, crowding in to record, in digital imagery, their genuine experience with Davinci’s painting. 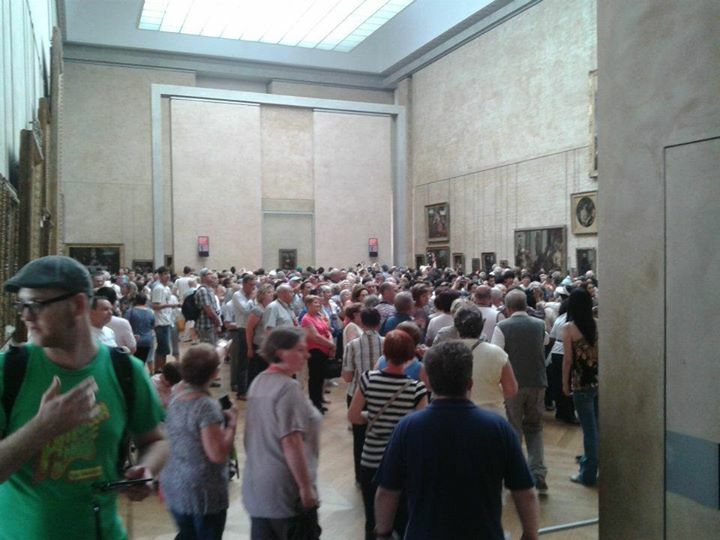 Which then causes me to wonder, perhaps being within this crowd, within that swampy room, is what makes a first-hand viewing of the Mona Lisa a genuine experience. Perhaps it’s our perception of authenticity that’s changed. That is, where before, simply viewing the painting was enough to create a link between the viewer and the artist, now, simply being within that crowd is what determines one’s personal interaction with the Mona Lisa as genuine. Leopards break into the temple and drink the sacrificial chalices dry; this occurs repeatedly, again and again: finally it can be reckoned on beforehand and becomes a part of the ceremony. At Athens, Lysimache, the priestess of Athene Polias, when asked for a drink by the mule drivers who had transported the sacred vessels, replied, ‘No, for I fear it will get into the ritual. We’ve amended the experience of viewing something first-hand in such a way that it has become ritual. Thus, no more is the experience given meaning via our mere presence amongst and in front of something that we ourselves have registered as important or sacred. Now, the genuineness of the experience is manifested by the time we spent waiting to view that sacred thing, how long the line was, and how many people we fought in order to take a picture on our phone. We might then ultimately conclude: no wonder it seems that our perceptions of the sacred, and mankind’s connection to that sacred, appear ‘secularized.’ Which, I’d argue, is actually a misperception. It’s not so much that the sacred is any less sacred, or that we view it that way, it’s just that we’ve forgotten to consider how our perception of the relationship between ourselves and that sacred has changed. That is, where in the past, the ritual was determined by a specific interaction, now it’s determined by a wholly different sort of connectivity. We no longer find ourselves in awe just of the Mona Lisa. Rather, we’re in awe of the time it took to shuffle through The Louvre to see it, the amount of people we fought to get close to it, and the clarity of the picture we subsequently post on Facebook. The leopards have drunk the sacrificial liquid, and our relationship with the sacred has merely evolved to accommodate the fact that we, on occasion, forget to check when the exhibition closes.